This recipe makes a version of the Chinese classic In less than an hour. 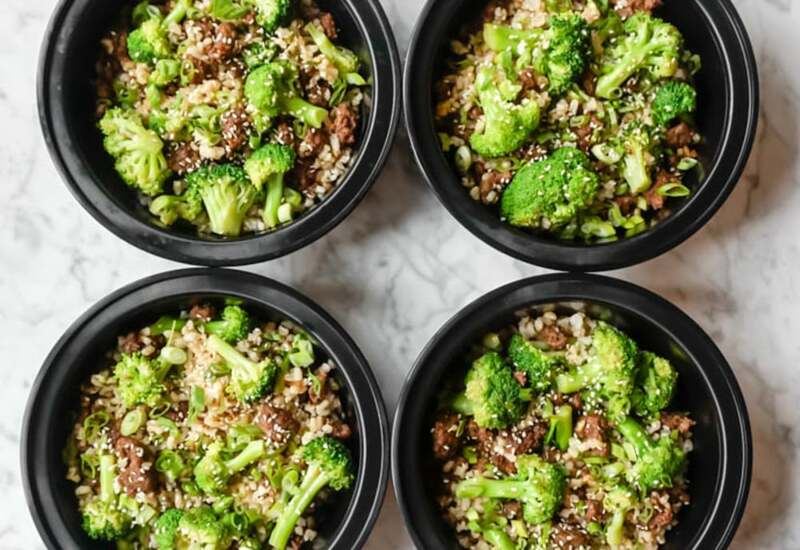 Mix the broccoli, ground beef, and brown rice together and divide into lunch containers to have four delicious meals to-go for the work week. Everything comes together with a flavorful sauce made with soy sauce, brown sugar, fresh ginger, rice wine vinegar, sesame oil, and sriracha. A garnish of green onion and sesame seeds will make you think you ordered take out! While this is presented as a "meal prep" idea, you can just as easily serve it immediately upon completion for a tasty dinner for four! It is always a family-friendly hit! Per Serving: 509 calories; 28g fat; 27.0g carbohydrates; 37g protein; 101mg cholesterol; 751mg sodium. This beef and broccoli meal prep was really delicious, and also really filling! Such a quick and easy recipe! It's also really budget friendly! I was spending so much money eating out every day, I'm so glad to meal prep now! This is one of my favorite meal prep recipes because it's simple, quick, and budget friendly. You don't have to use a fancy cut of meat to enjoy this dish. I made this recipe but found myself having to use a lot of soy sauce to really get the flavor I like. Then it was a little salty, so next time I may go with low sodium soy sauce or tamari. Still, I like the use of ground beef because it’s budget friendly.